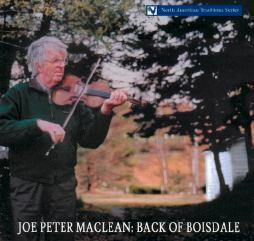 This is Joe Peter MacLean's (1945-2013) only recording. Brought up in a Gaelic speaking household he was the last person in Cape Breton who was not educated in an English speaking school. During childhood Joe Peter was surrounded by Gaelic singers, storytellers and fiddlers. The diverse repertoire on his CD reflects that upbring - from ancient song melodies to modern book tunes. Piano - Janet Cameron & Gordon MacLean. 1. i. Stumpie -- strathspey, ii. London Lasses, iii. The Red Mill (Dan Hughie MacEachern)--reels. 7. i. Lady Madelina Sinclair (Niel Gow), ii. Niel Gow's (Duncan MacIntyre) --strathspeys, iii.The Grey Old Lady of Raasay -pipe reel. 10 i. The Bobs of Fettercairn, ii. Munlochy Bridge -- strathspeys, iii. Lady Georgina Campbell reel. 11. i. Christie Campbell, ii. Anthony Murray --strathspeys, iii. Appin House, iv. The Bridge Of Bamore, v. Miss Wedderburn -- reels. 15. i. The Highlanders Farewell To Ireland -- strathspey, ii. Muileann Dubh, iii. Hamish The Carpenter - reels. 16. i. Charlie MacLean's Strathspey, ii. Cameron's Got His Wife Again - strathspey, iii. Homeward Bound , iv. General Stewart (aka Lady Muir MacKenzie), v. Jenny Dang The Weaver -- reels. 17. i. James Cameron's March (Jerry Holland, SOCAN), ii. Johnny Pringle (Wm. Marshall), iii. Money Musk (Daniel Dow) -- strathspeys, iv. Nigeann Donn, v. The Honeymoon, vi. The Dismissal Reel (Sandy MacLean) -- reels.